Services - Great Lakes Bay Construction, Inc.
From concept to completion, we use computer aided design technology to show perspective plans, which then assist in estimating and construction. Every project is unique. We provide conceptual, preliminary and hard estimating to meet your needs. Even after warranty expiration, we can provide timely service for emergency and non-emergency building maintenance needs. Working with a design-build construction company means that we’re your sole source of contact throughout the entire building process – from concept to completion – helping to minimize costs, streamline schedules and achieve maximum efficiencies. We manage the design, estimating, procurement and build of the complete project – simplifying the process for you. GLBC is responsible for design and construction, forms the best team, and partners to provide a quality end product. Our clients receive early determination of construction costs. We are always looking for ways to decrease costs and engineer added value. We minimize design and engineering costs by creating construction documents our team can build from. We utilize our in house design and construction team to fast track the design and construction process and allow our clients to occupy and operate faster than the traditional contract method. Our focus on excellence allows us to select the desired team of vendors, subcontractors and consultants to provide a high quality project. Not every project needs a design-build contractor; therefore, we provide general contracting services, too. 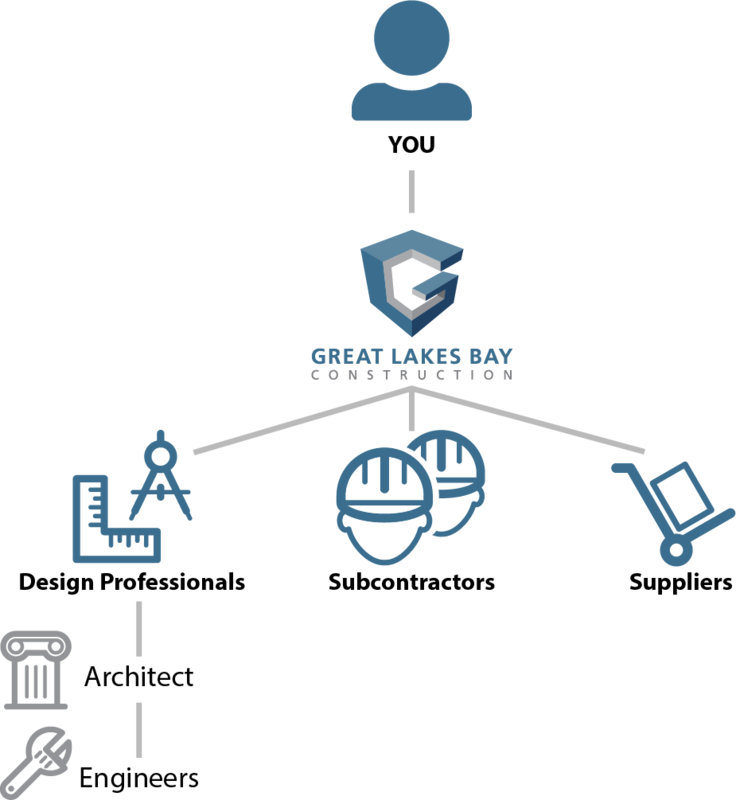 When you choose Great Lakes Bay Construction as your general contractor, we look at the “big picture,” managing the overall project, budget and timeline. With consistent, open communications through our construction enterprise software, by phone or by email, you’ll keep up to date on the progress of your project. We share openly with our customers communicating on a regular basis. We always look for ways to redesign and save our clients’ money, whether its during bidding or during construction. We take pride in our work, and treat each project like it’s our own. We take the project management burden from our customer, resolving issues that may arise on a project swiftly and with ease. Our team includes highly skilled carpenters, who cut, shape and install various building materials – turning your project into a piece of art. We offer quality craftsmanship from our experienced carpenters. Our safety minded staff has the highest respect for safety through daily job site checklists, housekeeping checklists and daily job site analysis.